Exclusively revealed one month ahead of the Paris Motor Show, the Citroën CXPERIENCE CONCEPT embodies the brand's "Be Different, FeelGood" promise in the large hatchback segment. With its distinctive body style, this new and stunning concept illustrates the benefits of the Citroën Advanced Comfort® programme. Citroën will showcase a world first next month at the 2016 Paris Motor Show with CXPERIENCE CONCEPT, which brings a fresh new approach to the hatchback segment. The exceptional new body style is a step forward that marks a new offensive in brand strategy. This innovative plug-in hybrid vehicle is immediately recognisable with its distinctive style and cleverly designed rear-hinged doors. The bold lines express power, while the generous curves express the car’s own stylistic language. Inspired by the high-tech world, the new front end, grille and updated signature headlights, create a unique style. The rear end also makes a statement with strongly marked wings and a concave rear window with a fin for improved aerodynamics. To contrast the pearlescent sea green exterior colour the premium materials inside the car are a citrus yellow shade to create a fresh and assured ambience. The seats are upholstered in a padded-effect yellow mesh fabric and the backrests feature an elegant shade of walnut wood. In line with the brand's know-how and heritage, this latest creation features the hallmark of Citroën vehicles. CXPERIENCE CONCEPT is the latest demonstration of the Citroën Advanced Comfort® programme, designed for the comfort and well-being of all passengers. Supporting the styling and technological development of new brand models, the programme reflects changing customer expectations and is considered at every stage in the design process. An easy to use infotainment system allows passengers to control a range of functions. A smartphone and mobile tablet can also be used to activate a range of controls including starting the car and sharing media files with other passengers. 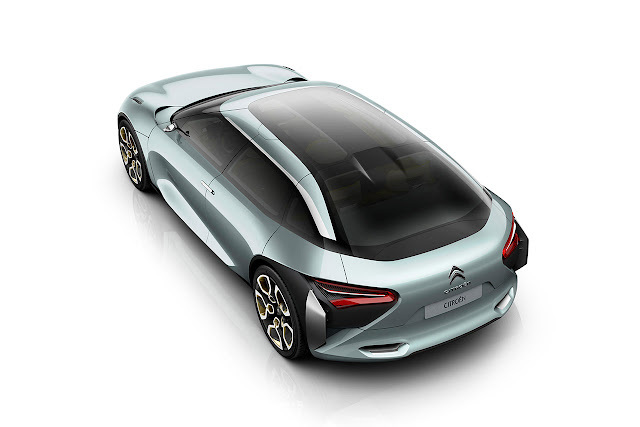 CXPERIENCE CONCEPT also features the ConnectedCAM Citroën™ premiered as a world first on Citroën’s New C3. All technology will be available for testing at the Paris Motor Show. With its unique, distinctive body lines, the CXPERIENCE CONCEPT car expresses a new take on executive hatchbacks, a territory that is close to the brand and its history. It is an aerodynamic concept car whose design reflects the emphasis placed on every detail. Designed by Citroën Styling, CXPERIENCE CONCEPT expresses the brand's new aesthetic codes. An innovative vehicle, it is inspired by the high-tech world on the outside, and by furnishings and travel on the inside. The innovative hatchback measures 4.85m long and 2m wide. The very low roof (1.37m tall) and short overhangs (3m wheelbase), contributes to the CXPERIENCE CONCEPT car’s flowing lines. The pearlescent sea green "Mizuiro" bodywork is modern and relaxed, and sits on 5-spoke 22-inch wheels. At the front, this concept shows off its pure lines with an original light signature expressing a new take on the layered headlights that are part of Citroën's identity. Other attributes of CXPERIENCE CONCEPT include a smooth front end and special grille. The chevrons accentuate the vehicle's width with the chrome-finish bar angling out to the headlights. The V-shaped daytime running lights (DRL) give the car a high-tech look, and are made up of fine 3mm wide strips with the indicators elegantly positioned in between. Further down, the light signature is completed by three LED directional headlights, positioned either side of the vehicle. For greater efficiency, the controlled air intakes are integrated in the front bumpers. Mobile flaps designed to open and close are positioned on either side of the vehicle and contribute to the aerodynamic performance on the road while also making manoeuvres easier. The rear end of the concept car also makes a statement with strongly marked wings and a concave rear window with a moving fin for improved aerodynamics. The 3D rear lights featuring laser fibre optics are also V-shaped. The indicators are positioned in the centre under a slim one-way panel, giving CXPERIENCE CONCEPT a unique, high-tech identity. The light system is fitted in a black technical block and the lines follow the cut-out of the boot, underlining the width of this large hatchback. Like Citroën’s most recent vehicles, the chevrons at the rear of the concept car feature a black lacquer finish. Other characteristic styling features contributing to the unique personality of the CXPERIENCE CONCEPT car are the rear-hinged autoclave doors rising to the top of the roof and opening to a 90°perpendicular angle (in line with the wheels), making it easy to get in. The doors provide an excellent view of the spacious and comfortable cabin. Inspired by architecture, decoration and furnishings, the cabin of CXPERIENCE CONCEPT is a work of clean, contemporary lines. Featuring premium materials, it is decorated in a citrus yellow shade. Alongside the single-spoke steering wheel, a nod to the brand's history, the floating dashboard is horizontal in design. It has a three-dimensional appearance, with a sculpted, tubular cut-out extending from the right rear door to the left rear door in a single piece. This reinforces the immediate impression of space and lightness. Considerable emphasis was placed on the design of the seats, which are upholstered in a padded-effect yellow mesh fabric. The backrests feature an elegant light shade of walnut wood, similar to the dashboard. Designed to resemble alcoves, the inner door panels are also made from high-quality materials including the sea-green geometric fabric which matches the body colour and contrasts with the interior ambience. The flat foam floor is covered in dark, textured leather with a de-structured design and is bordered by broad chrome-finish sills on either side. Comfort is a concept that has always been closely linked to Citroën and "Citroën Comfort" has become a true brand signature. Today, this concept has become part of a broader approach with a range of criteria including brightness, space, ergonomics and connectivity. All these criteria contribute to well-being in body and mind and encourage connectivity and sharing experiences on-board the CXPERIENCE CONCEPT car. The Citroën Advanced Comfort® programme was fundamental in the design of the CXPERIENCE CONCEPT, demonstrating how Citroën is delivering greater comfort derived from its modern vision and expertise in design. Designed as a true "cocoon", CXPERIENCE CONCEPT filters out the outside world along with the bumps and dips of the road and employs a progressive hydraulic cushion advanced module. This exclusive Citroën technology significantly improves the filtration system regardless of the defects in the road ensuring outstanding driving comfort. Entirely focused on the well-being of the occupants, this large executive hatchback conveys an impression of immediate, intense ultra-comfort, for both the driver and passengers. The interior was designed to promote well-being, as illustrated by the seats. The generous, body-hugging seats of CXPERIENCE CONCEPT provide unique comfort and support. Made from flexible shape-memory foam, they invite the occupants to enjoy a new travelling experience. In the front, both the driver and passenger have wide, welcoming seats. The enveloping seats in the back reflect the same "living room" mindset using warm, natural materials. To make every journey a friendly, relaxing experience, the front seats feature tapered backrests and open headrests to provide greater visibility for passengers in the rear. CXPERIENCE CONCEPT features ingenious storage compartments to make life easier. Positioned conveniently around the cabin, they contribute to the comfort of the passengers and their day-to-day well-being. The dashboard creates an impression of space with its geometric shapes and graphics. The central console includes a storage compartment at the front, and a separate compartment for charging a smartphone. The emphasis placed on light, another part of the Citroën Advanced Comfort® programme, also contributes to the sense of on-board well-being. With wide windows and two sunroofs running the full length of the car, the ambient lighting and air purifier also contribute to making the cabin a "Feel Good" area. To ensure a peaceful and safe on-road experience useful driving information is projected into the driver's field of vision on a wide head-up display. 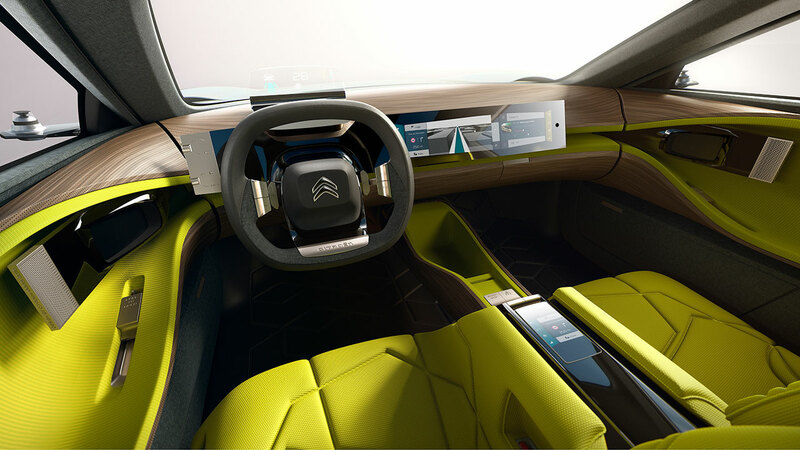 The Citroën CXPERIENCE CONCEPT car is welcoming and comfortable as well as being connected. With an intuitive human-machine interface designed to provide continuity between digital worlds for the driver and passengers, the latest intelligent technologies are simple and easy to use. The 19-inch rectangular touch screen is the key focus of the dashboard and central console and is used to operate on-board functions such as air conditioning, driving aids, navigation and media sources. The touch screen is split into several parts, putting the emphasis on the driver as well as the passenger. The screen can be configured in 1/3 – 2/3 or 2/3 – 1/3 or in full screen mode, depending on the desired on-board experience. The infotainment options allow passengers to find information on their journey, select their own music or watch their favourite film. The CXPERIENCE CONCEPT features a range of connected services, enabling the driver to open the gate from a distance, for example, or receive home deliveries. A smartphone and mobile tablet help to maintain digital continuity and have the option to activate a number of on-board functions. At the front, a central console houses a dedicated smartphone stand. Induction-rechargeable and connected to the screens, the smartphone starts the car and activates a range of control functions (comfort, photos, videos, etc.). Passengers in the back seats have access to a mobile tablet. Presented in a case, the tablet lets the occupants adjust the seats and air conditioning at the same time, as well as providing access to media sharing through the new app ‘Share with U’ as part of a fun and intuitive approach. With this new service, media files (games, music, videos) can be with shared with other passengers. These features will be available to test at the Paris Motor Show. Citroën CXPERIENCE CONCEPT provides high-tech rear vision with front and rear cameras. The conventional wing mirrors are replaced by two discreet side cameras which send pictures to small digital screens. Featuring chrome surrounds, these small screens are positioned along the inner door panels on the same trim as the loudspeakers and air vents. The driver has a 360° view of the vehicle's immediate environment, making driving and manoeuvring easier. CEXPERIENCE CONCEPT also features the ConnectedCAM Citroën™ premiered as a world first on Citroën’s New C3. Located just behind the rear-view mirror, this wide-angle HD connected camera records whatever the driver sees on the road. It captures moments in pictures and on video to keep or share on social networks. The Citroën Style designers have also placed considerable emphasis on sound. Working on the “sonification”, they applied the same principle as for the Citroën AIRCROSS concept car, an SUV premiered at the Shanghai Motor Show last year. The open front and rear headrests feature two loudspeakers with integrated bass sound and microphones. These sound bubbles let everybody choose who they want to communicate with or provide an opportunity to listen to a private audio programme. For easier discussions or to keep an eye on young children, integrated cameras make it possible to see each passenger or even to take part in a video conference. The emphasis on intelligent technology can also be seen in the choice of a plug-in hybrid solution for a relaxed drive. A true invitation to travel, Citroën CXPERIENCE CONCEPT features a plug-in hybrid drivetrain with efficient performance, power and versatility. Citroën CXPERIENCE CONCEPT delivers outstanding dynamic performance with a petrol engine developing between 150 and 200 hp and up to 80 kW of additional energy provided by the electric motor. CXPERIENCE CONCEPT can be driven in all-electric mode in the city (ZEV -Zero Emissions Vehicle) where it has a range of 60 km. On the open road, fuel consumption can be limited by using the two forms of energy together in successive acceleration phases. On the motorway, the internal combustion engine takes over to deliver real performance at the wheel, with total power of up to 300 hp. 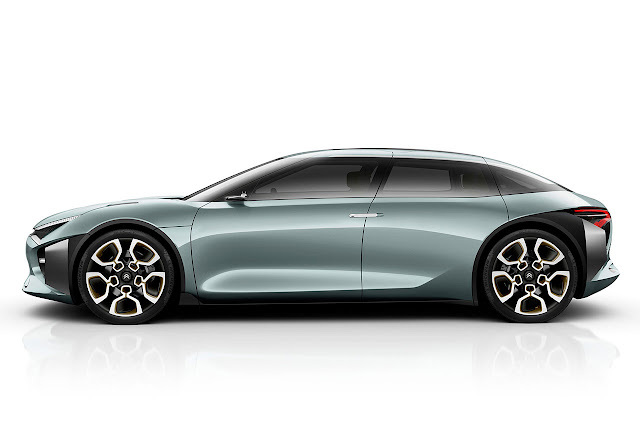 Citroën CXPERIENCE CONCEPT has a 3 kW battery that can be charged in 4.5 hours with a standard charging system, or in less than 2.5 hours with an ultra-simple charging solution based on a 6.6 kW charger designed for connection to a 32A socket. The attractive, functional signature of this drivetrain can be seen on top of the bonnet in the form of two battery charge indicators extending the line of each DRL. 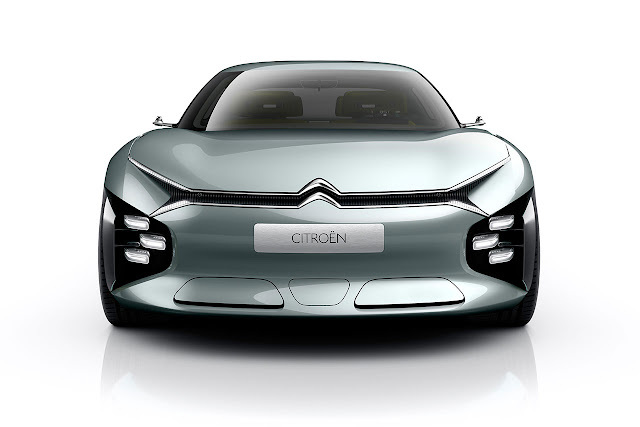 The architecture of Citroën CXPERIENCE CONCEPT is ingenious and unique. The 8-speed electric automatic gearbox is placed between the internal combustion engine and the electric motor, and a compact battery is positioned under the cabin to deliver electric power to the rear axle. This ensures both passenger space and boot capacity. This new plug-in hybrid solution allows drivers and passengers to enjoy a new driving experience whereby they can travel from city centres to the most isolated areas without restriction, receiving exceptional dynamic performances as a direct result of the additional energy from the electric motor, while also respecting the environment.